You heard right. I have a new album out this month. It’s called Rewinder. It was produced by DJ MF Shalem. And it’s amazing. But don’t take my word for it. Here’s a little info from the fine folks who are putting it out, Fifth Element (a division of Rhymesayers Entertainment). “Fifth Element is back in full effect with our latest Limited Edition FE Exclusive CD Release (300 Copies only!) that will be officially available on BLACK FRIDAY: 11.25.11!! For this release we embark on our second collaboration with the very talented, entertaining, and humorous MC and Producer, Grip Grand. Our first joint venture was the FREE DIGITAL DOWNLOAD for his “Cassette Trippin” project, which is magical journey of great & fun rapping over a string of Hip Hop classics and more, and better yet it is still available for FREE HERE! Shalem and I met through mutual friends in the Rec League crew (Cali’s best crew you never heard). When I was finishing up Brokelore, he came through in the clutch with a last minute remix of my song 96 Tears (we couldn’t use the original beat I rapped on). His version appears on the album. In 2009, I was working on my Chart Toppers mixtape. Every week, I looked up the current list of Billboard #1 hits (rock, pop, whatever) and remixed one of them, adding my own vocals and production stuff. Impressed by my ability to churn out a new song every week, Shalem suggested we collaborate on a full-length album. He would send beats every week, I would make new songs as fast as I could, and soon we’d have a whole album. It didn’t work out exactly as we’d planned. In the years following, both of us had our first sons, and our lives got pretty busy. But we did manage to bust out the record faster than any of my previous projects, working on instinct and trying not to overthink everything. Go from the gut, that’s what I tried to do, anyway. If asked what kind of music we make, Shalem and I would both be quick to tell you “rap music”. No fancy labels or sub-sub-genrefication. 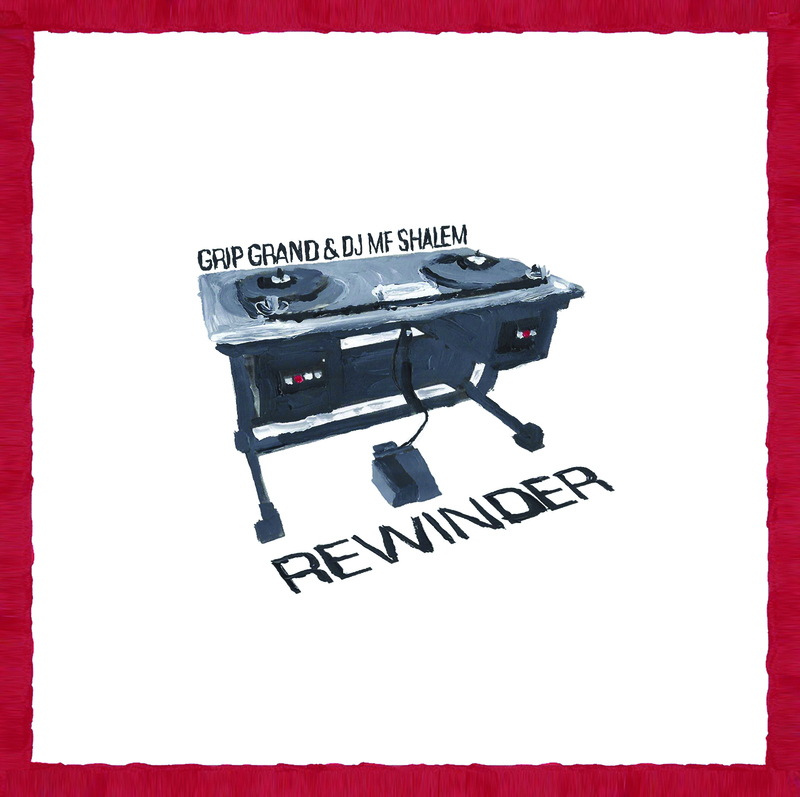 Our aim with Rewinder was to make an album as consistent as the classic “one DJ, one MC” combos of yesteryear: Pete Rock & CL Smooth, DJ Premier & Guru, etc. Today’s multi-producer/guest affairs tend not to have the same sound that you get from having a single producer and a single rapper on the project. Thanks, Fifth Element! So there you have it. 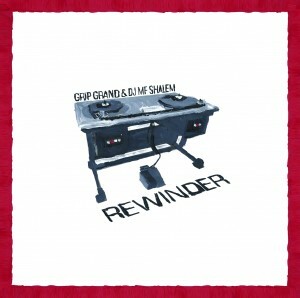 Rewinder CD available from www.gripgrand.com, www.djmfshalem.com, and www.fifthelementonline.com on 11/25/11. Available for download on iTunes, etc. the same day. Available from gripgrand.bandcamp.com on Christmas. You may now rejoice.